Awarua Radio was a New Zealand Government (Post & Telegraph Department, later NZ Post Office) communications station, located at Awarua, between Invercargill and Bluff on the South Island of New Zealand. It was sometimes referred to as the Bluff wireless station and the letter B features in its callsigns. The station opened on 18 December 1913, several months ahead of schedule, as workers for the German contractor were anxious to return home before war was declared. The station closed after almost 78 years of service on 30 August 1991. Awarua Radio was virtually identical to Awanui Radio and the two stations officially opened on the same day. They were each built on a 100-acre site selected by engineers from the contractor (Telefunken) and used a spark gap transmitter rated at 30KW input (15KW output in the aerial) and a massive umbrella aerial supported by a 400 ft tower. 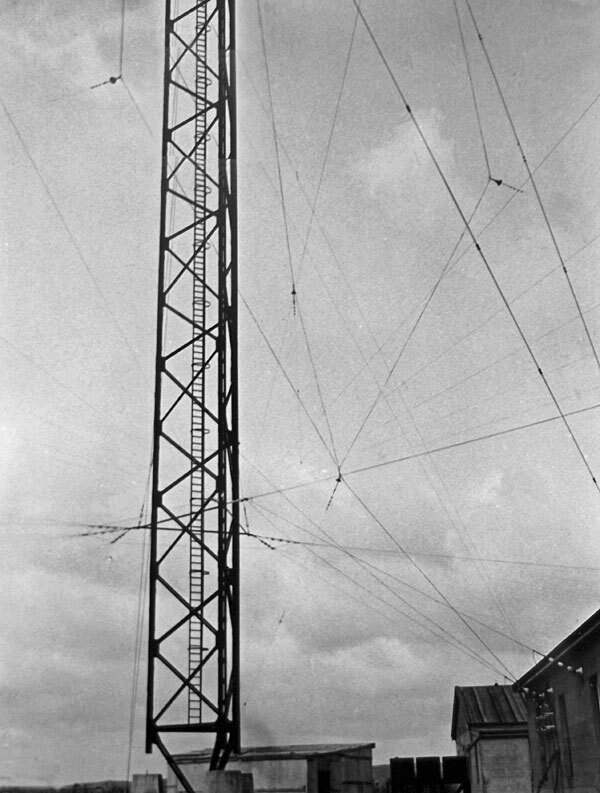 The original 400′ tower at Awarua Radio, erected 1913 and demolished 1938. Date unknown. Awarua Radio began operating on 18 December 1913 to provide ship-to-shore communication and weather reports of the Southern Ocean. The station was built by the German company Telefunken, and their engineers were attracted to the terrain of Awarua for effective transmission and receiving, as it was similar to the large plain at Nauen, 40km from Berlin and home of Telefunken’s test station. With the forecast of war with Britain there was belief that the Germans were hastening to complete their assignment for Germany’s benefit! By 1924 ZLB had become a vital link with whaling ships traveling to and from the Ross Sea. Awarua was the only communication channel with the outside world for these expeditions. In early 2016, a group of volunteers opened a museum on the former Awarua Radio site. For more information, please visit awaruamuseum.co.nz. Much of the content about ZLB on maritimeradio.org is from a website created by the late Alan Gilchrist ZL4PZ and has been used with his permission. Many other people – in particular Alex Glennie – have also provided material. My name is Jan Hoffman born 26 November 1952 and grew up in Bluff/ Invercargill area. I had the misfortune to use ZLB Awarua Radio in 1970 by calling a Pan emergency call. The skipper of the fishing boat collapsed and died at the wheel steaming towards Bluff. The boat’s position was a little west of Centre Island. The radio operator kept in contact with me until I reached Bluff heads where the authorities were there to meet me. It was a few stressful few hours as I was the only other person aboard. I never really got to meet the operator to personally thank him. For reference the callsign of the boat was ZM6873. I left the area and went to sea very shortly after that and was not aware the radio station had shut down. Are you the same Jan Hoffmann who worked, along with your brother Earl, aboard the Norwegian ship “Bernhard”? The late Joe Bell and I, were on the 7pm to 1am shift that fateful evening. Joe, not far from his retirement, was on the MF 500 kcs radiotelephony watch, while I was on the HF 2182 kcs radiotelephone watch, in the shared distress watchroom. On May 23, 1966, on the evening shift, Joe and I were probably yarning, the usual time filler in between broadcasts. I recollect that the receiving conditions on both watches were quite good that evening, with only a slight amount of background static. Certainly the Aussies were coming in loud and clear in 2182 kcs. There was an Italian ship, the “Enrico Fermi”, calling an Aussie station on 2182 kcs, a bit unusual as he would have normally used MF instead. I think he was calling either Sydney/VIS, or Adelaide/VIA, the time was a few minutes prior to 9pm. On 2182 kcs the silence period was due to commence from 9pm until 3 minutes past the hour. All ships and coast stations were supposed to cease transmissions during the Silence Period, as per International Convention. At about 8.59pm the “Kaitawa” broadcast a PAN call to all stations, indicating the vessel was in imminent danger of some description. Unfortunately, the “Enrico Fermi” continued calling over the top of the “Kaitawa’s transmission and some vital words were open to doubt due to this interference. At 9pm, the “Kaitawa”/ZMVC sent a MAYDAY call, indicating a sudden change of circumstances and that the vessel was now in immediate danger. Aucklandradio responded. During this fraught period of transmissions from the “Kaitawa”, the “Enrico Fermi” persistently continued his calls to the Aussie station. I recollect both VIS and VIA told him to cease transmitting because of the distress in progress. I will never forget the Italian’s response, “But I am the “Enrico Fermi” and I want to make a radiotelephone call.” I bet the Aussie station eventually gave him an earfull later on. While I was furiously logging all the transmissions on 2182, Joe was also logging Auckland/ZLD’s morse broadcasts on 500. The British vessel “Cape Horn” was assisting as a responder in the general area. At one stage, Joe turned to me and remarked he thought the “Cape Horn” sounded like he had “the shits up”, but it was more likely, in hindsight, to have been the very rough seas reported in the area at the time. The “Kaitawa” incident is well covered in various editions of New Zealand Shipwrecks, and also on this site. My take on what happened was that the cargo of coal may have shifted, affecting the vessel’s trim, caused by a combination of weather and sea conditions, hence the initial PAN call. However, a further dramatic change in trim prompted the MAYDAY call, due to those weather and sea conditions which ultimately completely overwhelmed the vessel and the transmissions ceased. I think it was all over in minutes, from start to finish, as far as the radio transmissions from the vessel was concerned. There was continuing confusion over the “Kaitawa’s” likely position. Joe and I stayed on our respective watches for the rest of the shift. The distress was controlled by Aucklandradio, we were just horrified bystanders. I also consulted “New Zealand Shipwrecks, 1998, 7th revised edition, by Ingram. I have just read the article about the sinking of the Union Steamship Co’s collier, Kaitawa. I was on the 2182 kcs r/t distress watch at ZLB during this incident. Senior telegraphist, Joe Bell, was on the MF 500 kcs morse distress watch; we were both in the same distress watch room, which was separated from the main HF receiving room. Joe and I, on our respective watches, thanks to excellent night reception conditions at the time, were well up with the unfolding tragedy over 1,000 miles away off the top end of Northland. Some of my past posts have disappeared, so I am posting this to test whether it will happen again. It is somewhat ironic I ended up at Awarua Radio, because between the period late 1953 (guess) and 1958, our family live only a couple of miles away from the radio station. We rented a small cottage halfway up the Woodend Road, now known, for some reason, as Blythe Street. I even remember our Rural Delivery number was RD 11. Due to our midway location in the Woodend Road, I was fortunate to be in the Tisbury School Zone, thus caught Bob Evans’ Bedford school Bus at the bus stop at the opposite end of the road from the Bluff Road end. There were kids from about four or five other Woodend Road families who also caught Bob’s Bus. I think we must have caught the bus fairly early because it was a long run, that included picking up the Watson kids at the end of the first Awarua Bay Road straight, before picking up the Woodies. I didn’t know much about the Chathams and the radio station, except from anacdotes told by various ex-ZLC operators, who had been there at different times pre-WW2, wartime and in the post-war period. I recollect most were there for a minimum of 12 months, but if they enjoyed the isolated island lifestyle they stayed for years. I remember some of the names: Bill Burt, Allan (Charlie) Glennie and Dave Dow, also Keith Ramsay, and there are others who’s names I’ve forgotten. As far back as my second year (1965) at Awarua, I had been asked if I would like to go to ZLC for a 12 months stint. The drawcard being a rare opportunity for a flight in a RNZAF Sunderland flying boat. However, I felt my proficiency as a radio telegraphist needed more practice and a full year away from civilisation was a bit too daunting; so I turned down the opportunity at this time. Strangely, it was a voluntary offer, so that was that until another 3 years had passed and a different time, and different circumstances, intervened. Let us fast foward the clock to March 1968. Once again I was asked, or told, I would be going to the Chathams the following month for six months. My Chatham’s adventures really belong in the ZLC thread, but as a teaser I can tell you I arrived on the Chatham Islands, on April 9th, the day before the disastrous TEV “Wahine” Storm, courtesy of SAFE Air’s lumbering Bristol Freighter, callsign ZK-CLT, affectionately known to us as “Lima Tango”. 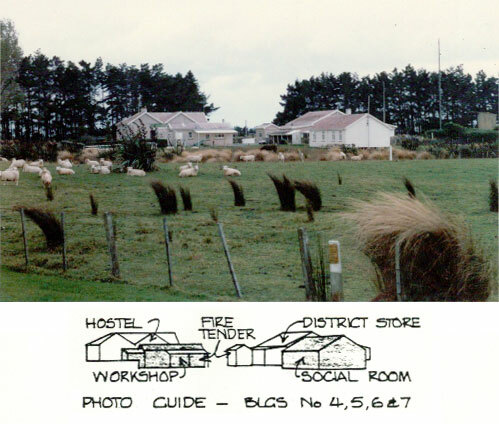 I left the Chathams around early October 1968, and returned to Awarua Radio, where I stayed to closedown in 1991. More about this interim period and also more details about my earlier ZLB years, coming soon. I joined the NZPO 13 Decmber 1963, at the end of my 3 years schooling at Southland Technical College. Mr Cyril Bailey, as Personnel Officer, CPO, Invercargill, signed me up as a 1st Division Cadet in the Telegraph Office. After being invited to become a radio telegraphist at Awarua Radio, and accepting after a visit to ZLB, I headed off in early February, 1964, to the NZPO Radio and Telegraph Training School, Trentham Camp, near Upper Hutt. Between February and November that year, I passed both the integrated courses in teleprinting and morse code. From memory, the teleprinter sending pass was 45 wpm, one correction permitted; the morse sending and receiving speed was 22 wpm, no errors ( ? ). I was transferred to ZLB after completing the courses. The most notible occurance on the flights home was the Wellingon to Christchurch leg, in a SPANZ DC3 Skymaster. The remaining leg, or legs, were by NAC F27 Friendship. Apart from a 7 month stint at Chatham Islands Radio ZLC from April 9th (note that date) until sometime in October, 1968. I returned to Awarua Radio and stayed there until it was closed on 30th August, 1991. Note: The infamous Wahine Storm occurred the next day, 10 April, 1968, my first work day at ZLC. More about ZLC in another post. Thanks Barry: Looking forward to hearing more!